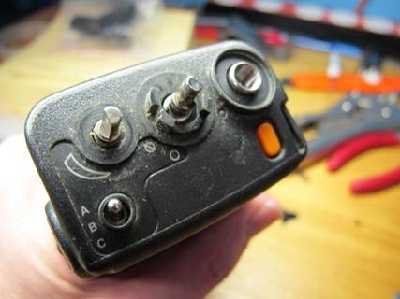 The following modification for the Motorola Jedi Series JT1000 was submitted by Gordon from Australia. Thanks mate! I decided to modify these radios as some standard scanners have poor sensitivity and selectivity. Motorolas have a greater sensitivity. 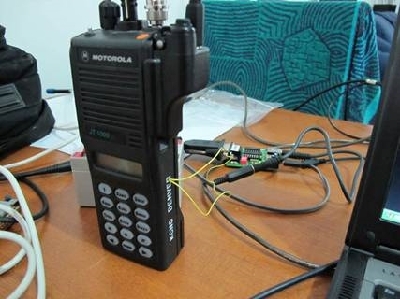 With the Motorola's designed for a specific frequency and better built and designed I found that they perform much better than any previous scanners I have modified. Before you start, please ensure you are electrically grounded as the Jedi series contains CMOS components and any static electricity could destroy the radio. This discriminator modification is not an easy one and should only be attempted if you are confident after reading the following text. Next insert a screwdriver into the very bottom of the rear of the radio (which the battery covers) as per the photo and pry the bottom of the rear part of the radio out. Once the bottom is free, slowly pull it down so the switches on top of the radio come out of their recesses. 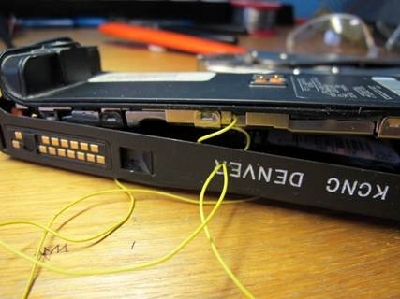 There is still internal connections so don't move the radio too far from the	front housing. With a small flathead screwdriver pry the edges of the two Flex cable connectors up (Cream coloured connector). 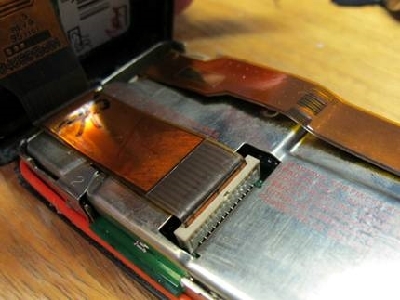 Once the edges of the connectors are up, the Flex cables can be easily pulled out freeing the front panel and allowing the RF shield to be removed. 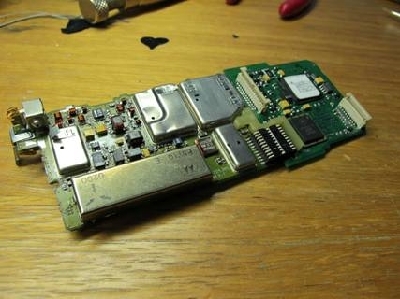 Next the shield needs to be removed exposing the Vocon Board (bottom) and the RF board at the top. 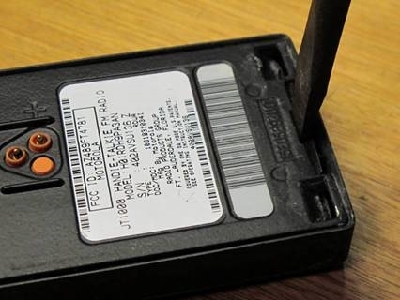 The RF Shield is held in place by 3 separate connectors on the old model and 4 connectors moulded into the RF shield on the newer models. 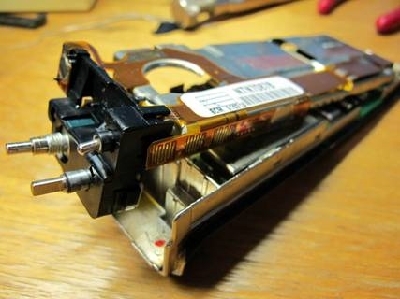 By placing a small screwdriver under the connector the RF shield can be easily removed. 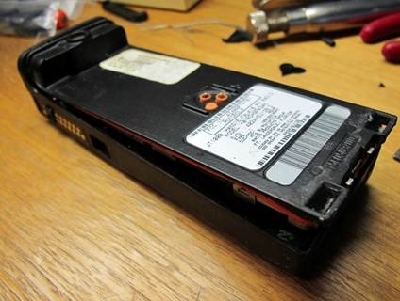 Also once the shield is dislodged the switch block will come away with it. Remove the shield and put it aside. With the shield removed the Vocon and RF boards are exposed. 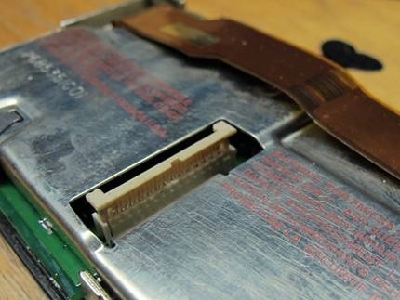 There are no hardwire connections between the metal rear and the boards. The joined boards just pull straight out ready for soldering. Now comes the hard part. Cable selection is important as I cant emphasise the lack of room inside the radio even for the smallest of cabling. I would have preferred to use small shielded cable but this was not possible due to extremely confined space. I chose to use very small jumper wire. 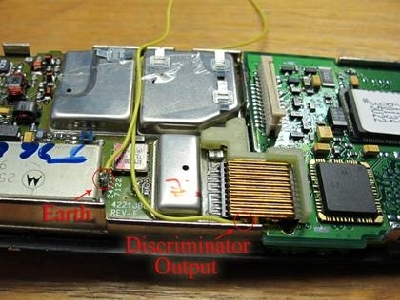 The discriminator output is located on pin 10 (RF Board side) of the interconnecting. This plug connects the RF board to the Vocon board. Pin 10 is the last connect on the bottom left side of the plug or is the bottom connection close to the left edge of the RF board. Don't be afraid to remove the solid interconnectors (between the RF and Vocon boards) as they are easy to re-install and by removing them it allows easy access for soldering. I placed the earth as per the photo but anywhere with a good earth would be appropriate. I have run the cables in between the two shields as shown and drilled a small hole in the exterior case to run the wires. To remove any DC component I have soldered a 10uF Tantalum on the discriminator output with the + lead towards the radio discriminator side. Reassemble the radio in reverse paying attention to the new cables that they don't get crushed. I have tried this discriminator with Mobitex and it works very well. No other type of decoding has been tested but if mobitex works well I don't see why other forms wouldn't work as well.